Herbert Hirche’s design of this chair refers strongly to the ›Bauhaus‹, where Hirche was a student from 1930 to 1933, his main teacher being Mies van der Rohe. Afterwards Hirche worked in van der Rohe’s office and later with Egon Eiermann. The ›Lounge Chair‹ was designed in 1953 during Hirche’s time as professor at the Academy of Art in Stuttgart. Unusually enough, the chair never went beyond prototype stage. 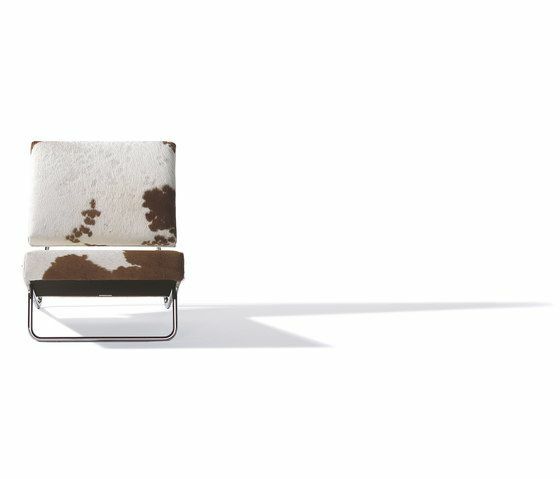 Only since the year 2000, Richard Lampert produces this classic with a variety of fabrics and cow skins.